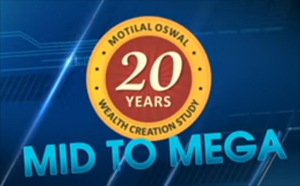 Motilal Oswal is back with 20th wealth creation study report (2010-2015). This report contains top wealth creator stocks from 2010-2015. It also contains Biggest, Fastest and Most consistent wealth creator stock from 2010-2015. We are here with crisp excerpt of report. This report is title as Mid-to-Mega – It means buy Midcap size which has potential to become Mega Multibagger stock. Mid-to-Mega stands for a company’s stock crossing over from the Mid range to Mega Category. Value Migration is the key driving factor of rapid Wealth Creation. This wealth creation study report is based on well known fact – Buy business at a price considerably lower than their “intrinsic value” or “expected value”. Industry leadership is a necessary pre-requisite to be a megacorp. Market cap rank is a powerful tool to assess a company’s current standing and the roadmap ahead. Mid-to-Mega marks a big change in ranks, driven by the lollapalooza effect of MQGLP (Mid-size, Quality, Growth, Longevity and Price). As per this report wealth creation is the process by which a company enhances the market value of the capital entrusted to it by its shareholders. It is a basic measure of success for any commercial venture. We rank the top 100 companies in descending order of absolute Wealth Created, subject to the company’s stock price at least outperforming the benchmark index (BSE Sensex in our case). These top 100 Wealth Creators are also ranked according to speed. TCS is biggest wealth creator stock for 2010-2015. ITC and HDFC Bank stocks are next in the list. This wealth creator stock also includes Sun Pharma,Hindustan Unilever ,HCL Tech,HDFC,Tata Motors,Infosys and Axis Bank. Ajanta Pharma is the fastest wealth creator stock during 2010-15, with Price CAGR of 119%. Next stock in list is Symphony with CAGR 108%. Another fastest wealth creator stocks are Eicher Motors,P I Industries, Page Industries, Wockhardt, Bajaj Finance,GRUH Finance,Blue Dart Express and Amara Raja Batteries. The most consistent wealth creator stock includes Titan Company, Sun Pharma, Asian Paints, Kotak Mahindra ,Dabur India, Bosch,Axis Bank, Cummins India, Nestle India and M & M. All these were able to give 2 digit return from 25% – 43%. You may be please to notice that three out of these wealth creator stocks TCS, Infosys,Asian Paints were already recommended by us in our article in 2015 – 7 Multibagger stocks for 2015. Download Full 20th Wealth Creation report by Motilal Oswal.